Millennials, your day may be done. Lest we forget, there’s a whole new burgeoning generation for marketers to freak out over: Generation Z. So twice a year, CNBC offers Piper Jaffray’s Taking Stock With Teens study. The most recent version, which just came out this week, contains some surprising factoids about the next great generation. As you’d expect, teenagers are focused on spending their money in primarily two categories: food and fashion. But this year, food is taking the lead. 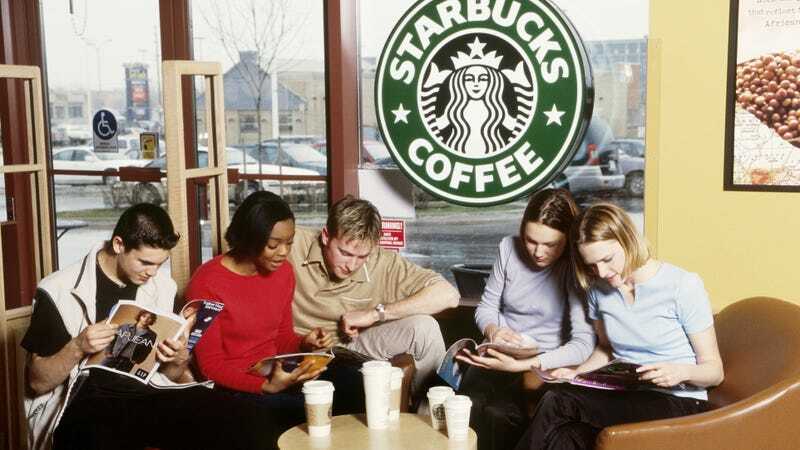 Seems that the teens would rather spend their after-school hours lounging around at a Starbucks than at a J. Crew. The study broke down a group of 1,400 young people into upper-income and average-income categories. The upper-income kids are “spending 24 percent of their cash on food, which trumped the amount spent on clothing by 4 percentage points. Teens from average-income homes are spending about 21 percent on food, 2 percentage points higher than their clothing spend.” Although the two categories were dead even for upper-income teens in spring 2014, when average-income teens even favored fashion over food, these latest numbers show a stronger surge for food, building on the category’s lead from last fall. As for where they’re spending those food dollars? Breakfast (2 percent) and lunch (20 percent) aren’t nearly as popular as the dinnertime hours. CNBC says as the Gen-Zers figure out where to hang, “Convenience is the second-biggest factor, followed by menu selection. Nutrition was the lowest-ranked attribute.” Shocker. Starbucks has ruled the young-people roost for several years now, but the studies shows some other surprising developments—like the fact that the upper-income kids now favor Chick-fil-A over McDonald’s, for example. For those kids, the top five is Chick-fil-A, Starbucks, Chipotle, McDonald’s, Panera. Average income kids favor: Starbucks, Chick-fil-A, McDonald’s, Taco Bell, and Buffalo Wild Wings. While we can certainly see the fun of spending the afternoon hanging around some fun coffee drinks or salty french fries, we hope someone points out to the kids that clothes would at least last a bit longer than a frappuccino. Just ask a random millennial, who probably had to learn that the hard way.